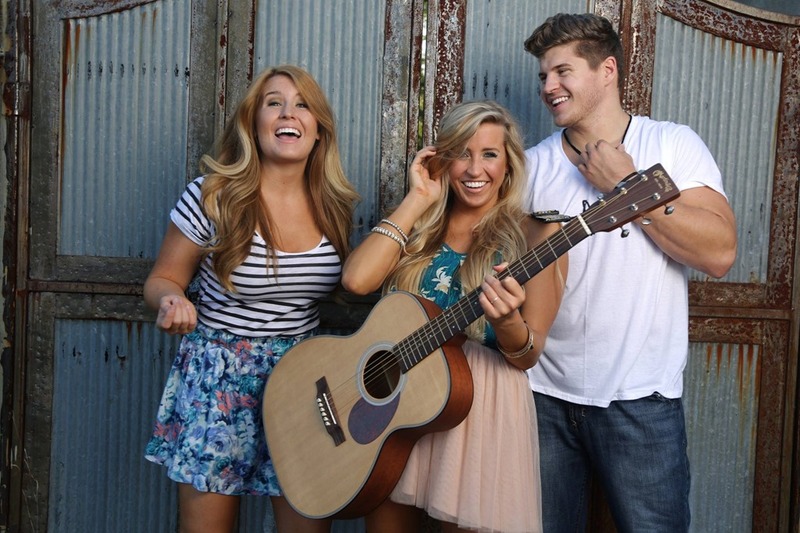 The Cains Trio "Stay On Board"
Taylor, Madison and Logan Cain form The Cains Trio. Hailing from Hartselle, Alabama, the trio released their debut album on October 28th. Entitled Stay On Board, the album features ten tracks, with all bar one (She's My Girl) co-written by at least one of the trio. The trio's debut single Be Yourself With Me is included as the opening track on the album. The soft drum and acoustic guitar lead makes it a comfortable, smooth track to listen to. The instrumentalisation also, interestingly, reminds me of Kacey Musgraves' Follow Your Arrow with it's guitar and banjo lead. Be Yourself With Me is followed by what is lyrically the 'darkest' track on the album, Smoke On The Hill. I was initially a bit unsure about the hip hop like base line but as the song progresses you can see that it fits well. Lyrically the track reminds me of Gretchen Peters' Independence Day with lyrics such as "I became his punching bag and lied about black eyes" and "mama tried to fight him off with all her 90 pounds, when you've been beat down all your life it's hard to stand your ground" and definitely adds an interesting dynamic to the album. Logan Cain takes lead vocals on I'll Take That Any Day and the reggae styling really suits his tone (which is similar to that of Jason Mraz or Hunter Hayes). The combination between Logan's tone and Taylor and Madison's more 'country' sound works surprisingly well and the relaxed feel to the production makes for a catchy track that I am sure will be played repeatedly by a lot of listeners. Fighting For Love is another strong track. "What's a little bit of arguing if it's something worth fighting for?" is a great lyric that highlights the central lyrical theme of "ain't enough people fighting for love". Taylor takes the majority of the lead vocal on the track - with a short interlude from Logan - and this allows her to show a poppier, more upbeat side to her vocal. Whilst I wouldn't say I necessarily dislike Beautiful Life it is probably my least favourite track on the album. I found myself wanting to inject more pace into the track at various points, it has a lot of long vocal notes that make the song feel a little drab and cheerless which is certainly unfortunate. As I mentioned previously, the mix between the trio's voices work really well. The Cains Trio should be very pleased with what they have released here, especially considering that this is just their debut album. The fact that they all take a share of the lead vocal shows that they are talented vocalists as well as being strong songwriters - they are also lovely people! - I'd definitely recommend a listen! Madison - We're really late comers to country music. We grew up home schooled and our dad's a pastor so we almost predominantly listened just to Christian music. I don't know if that's popular where you are but we have kind of a big contemporary Christian music....I don't know....we have a bunch of radio stations and stuff. So my first experience of country music was like Rascal Flatts and Keith Urban and that kind of stuff and we just fell in love with it so after a gateway into there we kind of had to back track and listen to some of the older artists like Johnny Cash. Who would you say your biggest influences are musically? Logan - I draw a lot of my musical style from a group called needtobreathe. I don't know if they're popular in the UK. They're more of a kind of folky kind of group, but they're also believers and so, I think that our sound is pretty unique but we like to draw our character influences from people. We think Garth Brooks is a great guy and, even though he had a rambunctious life, I like to look at Johnny Cash and see how passionate he was about music and that sort of spurs me on. Taylor - People describe our music a lot as happy and fun. I think that some of our sound, it naturally pulls from music like The Eagles, Kacey Musgraves - if you've heard any of her new stuff - so I think we have a sound like that but I don't think it's comparable to any of the trios that are going on right now because we all take a part in singing the lead. It's not just like one lead singer and the rest are background vocals, everyone takes an active part in each song and without that part the song wouldn't be what it is now. Our sound I think is really fun and it's just easy listening and all of our stuff is pretty positive just because we don't have that much negative stuff going on in our lives so we don't have anything sad to write about! How easy was it to decide which tracks to put on to your album? Madison - You know, there may have been some like brother-sister telepathy going on because over the period of I guess 2012, 2013 all we did was write and record. We never played out, we all had other jobs and so we had thirty songs to choose from to put on the album and I think that we really all agreed. There was a couple that we disagreed on so I felt like a lobbyist, especially for "The Traveling Kind" I was like 'this has to go on there!' so I feel like with the exception of one or two tracks we were all in agreement. Which has been the hardest track to write? Taylor - That song, I feel like ['The Traveling Kind'] almost took a year to write. We would take it in with some of our favourite song writers, Billy Lawson, and he'll....it was just a hard song to write. It was a unique story that was special to all three of us and just trying to write that took forever because you wanted to do the story justice. Madison - We didn't want it to be cut and dry, we wanted to leave it a little bit ambiguous as to what it was about so it's kind of hard to tell a story without fully telling it. One of the tracks on the album, Smoke On The Hill, has quite a dark lyric compared with other tracks. How did that come to be written? Madison - Well Taylor had originally heard this song called 'Ode to Billie Joe' by Bobbie Gentry, have you heard of that song? It's basically just kind of like an eerie song and we had all had this favourite TV show in college called Friday Night Lights. We were watching through all the episodes and there was this one episode....Taylor do you want to talk about it? Taylor - A guy was basically defending this girl that he loved from a stalker and he ended up accidentally killing him. It sounds kind of silly but it was like a really big deal, it was really good episode. After hearing 'Ode to Billie Joe' - you should listen to that, you'd probably like it - it's just a creepy song and you want to know what happens and so we wanted to write one that gave people a sense of they were included in the song and they were right there while the story was taking place. Where would you like to see your music career reach? Logan - For me I guess....and we can all kind of take a stab at it....for me, I don't know. I never necessarily had big dreams of being a famous person or anything but I certainly would love to see our music get us to a place where we could be people of influence. No matter how big a radius we effect, because I think that that's been the most enjoyable part thus far. Whether you sing perfectly or you play perfectly, when we get to come down off the stage and meet whoever came to the show and invest in their lives that's been the most rewarding part of all this I think. Taylor - We want to make our music come to you so we hope it spreads over there! [laughs] We've just been grateful for every part of it. There's so many talented people in the world and so many people trying to do music. We just never even dreamed, number one that we'd put out an album and that our single would even make it to radio play, so it's just been awesome every step of the way. It's hard for me to even believe it I just sort of take it in. If you could only own one record what would it be and why? Logan - That band I spoke of earlier called needtobreathe, they'd made an album called "The Outsiders". I think that was probably the first kind of collection of music that I had as an adult that I really cherished and like I bought the album. So that would be mine. Taylor - The Red CD. It's got holiday classics like Bing Crosby, Nat King Cole and a bunch of other older artists that we grew up listening to so it wouldn't be Christmas if I didn't have that I don't think! Madison - I know, we have home videos....from the time we were born until now we've listened to the same CD whenever we decorate the Christmas tree so that's definitely like, if your house is burning down I'd run for that. Logan - The best piece of advice I think we've received thus far, we were working with a performance coach - which at first I was like 'oh great' you know I didn't know like....in the developmental process and I was kind of like 'what the heck we're going to learn like High School Musical like choreography'. But anyway, she sat us down and she asked us 'why do you want to do music?' I of course chime right in and say 'oh because I'm living my dream, we want to live our dream'. She said 'nobody wants to buy a ticket to come watch you live your dream'. I was all like gosh, wow that's an awesome sentiment. It has changed my perspective. It took a lot of pressure off I think as well because it's make your show, make your career about actively trying to get the audience involved, sending them home feeling like they're living their dream. You don't have to play each song perfectly and you don't have to hit the best notes or anything but you can just be passionate about your music and get the audience involved. Which song do you wish you had written and why? Logan - I've been asked this before and I think I like my answer, "One More Day" by Don Mario, I don't know if you're familiar. There are any number of classics, these timeless songs that it just, when it comes on, no matter what radio studio or group is listening to it, it just sort of grabs you. Taylor - Shoot if I had written any of these number ones I would live in a totally different lifestyle! [laughs] I would probably have my car paid for, am I right? I don't know....what song....I think, there's a song called "Moon River" - have you heard of "Moon River"? It's an old classic. It's from Breakfast At Tiffany's....maybe it's not from there, it's probably older than that but I'm going to be getting married in July and I'm walking down the aisle to that song. I think it's really awesome, I wish I'd written that. Madison - Ah yeah, that's a good song. What's your favourite part about being a musician? Taylor - Well, we all went to college and we got degrees, graduated from there and kind of expected to continue to just work a regular job and go with the flow of most people our age so the coolest part for me is that I've been able to do music full time and just really experience what that lifestyle is like. Maybe not all the way but, you know, we get to spend more time with our family, we're getting to write song together. I'm really happy, I don't have anything to complain about it's been awesome. Madison - I think the best thing in the world to do is for a period of time work a job that you don't like and just do it anyway. That way when you finally get to do what you love you'll appreciate every part of it, even the hard parts. I think that's kind of true for all of us, not even knowing if we'd be together and now, even on the hard days we get to stay together and we get to make music. What's your least favourite part? Logan - My least favourite part is all the waiting that you have to do because it seems, in these early stages for us, no matter how successful on days you may feel, there are a lot of days where you're not playing anywhere, you're not in the studio and I just tend to feel like I hate being on someone else's dime. I'd like to play, I'd like to be able to provide and so that to me has been the hardest part, it's just been like 'all right, you're still doing okay even though nothing's happening right now' so it's like uuuugh. Madison - The difficulties with singing harmonies. Even in the studio we all have our natural parts and some songs are just written where you can't hear it and you're like 'how was this different from the song we just sang before' so waiting time and singing harmony for sure. Madison - But with lots of sugar! Taylor - [laughs] lots of sugar. No I, I think that I would love to, we've just got to have somewhere to go once we get there so if we can do that we're coming. Logan - Well we've got a friend! Taylor - Yeah, so if we get picked up pretty soon then that could mean UK tours for us. Labels: The Cains Trio "Stay On Board"